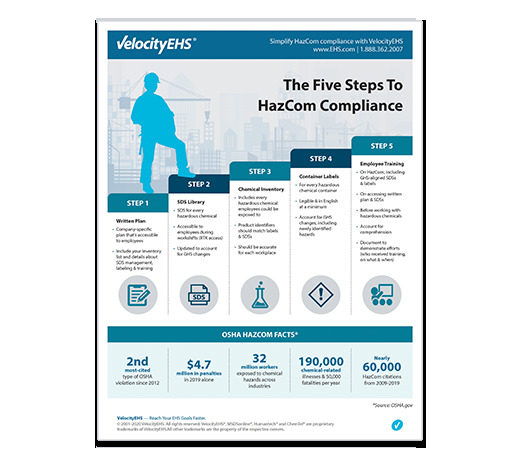 With the move toward GHS now in full swing, it’s more important than ever for safety and compliance professionals to make sure that their hazcom plan keeps workers protected and workplaces compliant. Under Hazard Communication Standard 29 CFR 1910.1200, OSHA requires all employers that have hazardous chemicals in their workplaces to implement an effective hazard communication program. It must include labels on workplace containers of hazardous chemicals, safety data sheets, training for workers, and a written program describing how the employer will meet hazcom requirements in each area. Each one of these elements can be vital to worker safety and preventing accidents, illnesses and injuries. This information is relevant and vital to today’s workers. As the new infographic points out, studies show each year American workers are estimated to suffer over 190,000 illnesses due to chemical exposure, and over 50,000 deaths annually are attributable to lifetime exposure to workplace hazardous material. For more information about all of OSHA’s hazcom requirements, you can visit their hazcom page here. Don’t wait for an OSHA inspection before taking action. Get a jump on compliance with our infographic today!